The Maryland Department of Natural Resources has taken a large-scale, proactive approach to ensuring continued preservation of valuable natural lands. By mapping priority green infrastructure hubs and corridors, the state can efficiently include these zones in planning decisions, shifting from individual projects to broader landscape considerations. 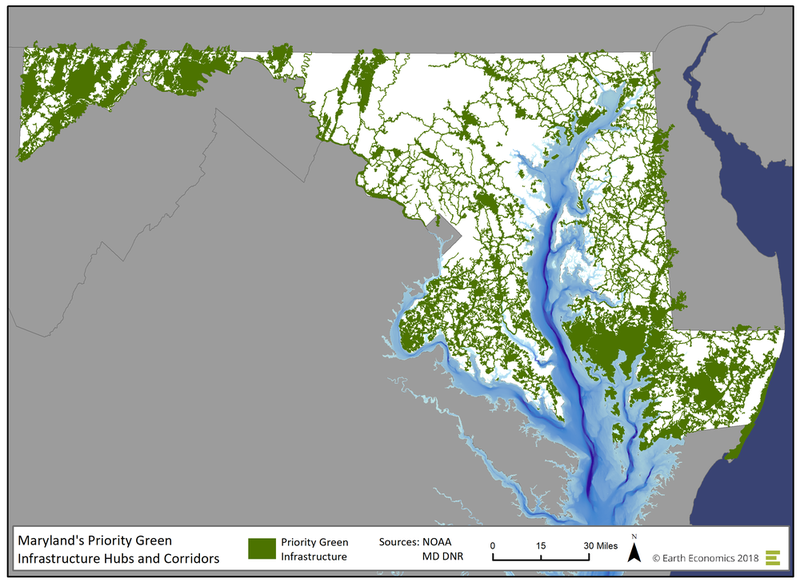 Detail from Baltimore - Washington, DC metro area: Understanding priority green infrastructure areas, from riparian zones to larger preserves, helps to inform future urban growth and maintain existing, critical green infrastructure. As city governance evolves, the unique boundaries that mark various functional zones and districts can complicate planning at scale. Negotiating the requirements of each entity can add additional roadblocks to already complex, multi-stakeholder projects. For example, in San Diego, one community planning district may cross into multiple council districts while also containing several different historic districts. Negotiating these regulations can create barriers for green infrastructure projects, particularly those connecting areas across a city. Regional Code Collaboration In order to maximize efficiency, capitalize on economies of scale, and incentivize regional adoption of sustainable development best practices, communities in the Puget Sound region of Washington state convened a cross-jurisdictional group of planning and code experts to collectively review and revise ex-isting development codes that were impeding sustainable development at scale.